AquaSieve2 is a Solid Separation Pre-Filter. With this high impact, implosion resistant jewel you can quit being a slave to that strainer basket on the front of your pump. No more will you have to do daily bows before that tiny strainer basket on your pump as if it were your master. 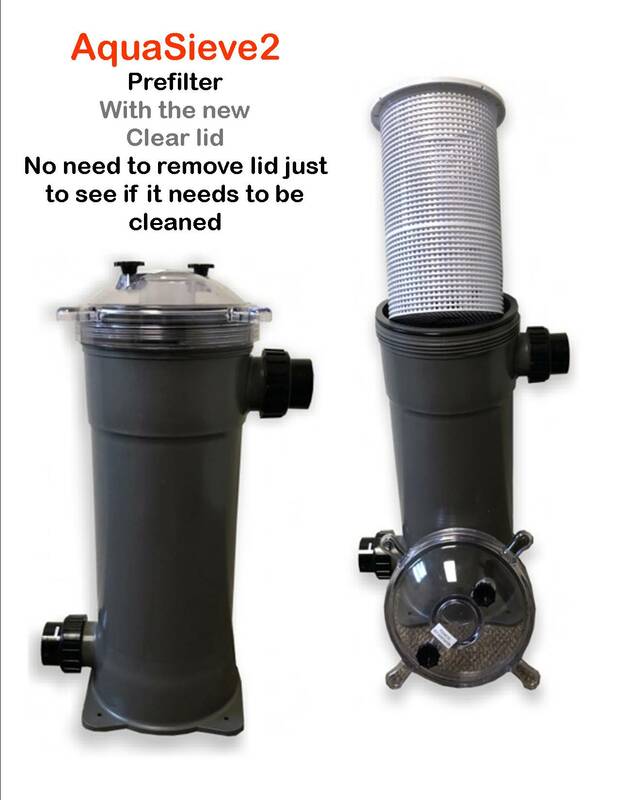 Most people report that this mammoth size pre-filtration strainer only needs cleaning every 1 to 4 weeks. Now you can have your life back. Leave town on vacation and don't worry about that tiny basket strainer on your pump clogging and shutting down your system. Your neighbors will love you for this, because now they won't have to clean your pump basket while you're gone, the AquaSieve2 can wait until you return. CLEAR LID lets you see if the basket needs to be cleaned without removing the lid. Simply install AquaSieve2 between the pond and pump. The AquaSieve2 installs in just minutes. Makes hard to prime pumps prime easily, due to the reservoir of water in the AquaSieve2. Unlike some solids separators that require a lot of confusing, flow robbing pipe work and valves, the AquaSieve2 is totally simple, not only to install, but to care for too. Simply bring the water from the pond into the top fitting and hook the inlet on your pump to the bottom fitting. It's that easy with the AquaSieve2 Pond Strainer. At one time we offered a product called the AquaSieve that was stainless steel. This tank is no longer available and we now offer the AquaSieve2 as a high quality replacement for the original.